CHRYSLER 300 SERIES - (V-8) - The 300 facelift of the 1969 model paralleled the styling updates seen in the other 1970 Chryslers. Disappearing headlights were retained in the 300 Series. A 300 emblem was placed in the center of the grille, which had black vertical bars. Two. thin rectangular moldings were placed on either side of the center of the grille and were painted in red with bright edges. Tail lamp design treatments differed from other 1970 models. On 300s they ran unobstructed, across the rear indented area of the bumper. Standard equipment included body accent stripes, all-vinyl or cloth and vinyl bucket seats and Torqueflite automatic transmission. This was the last year for the Chrysler convertible. The high-performance 300-H was a modified Chrysler 300 built by Hurst Performance Corporation. It was offered with saddle color leather bucket seats; fiberglass power bulge hood (with functional air scoop); dual, depressed, rotary hood latches; fiberglass deck and rear end caps; special paint (Spinnaker white); Satin Tan color accents; special striping and an integrated wing-type rear spoiler. Other standard features included: 440 TNT engine; heavy-duty suspension with sway bar; styled road wheels and raised white letter tires. 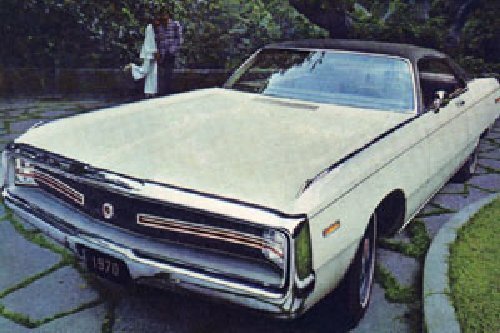 Other features found on all 1970 Chrysler 300s included heavy-duty battery; cleaner air system; turn signal indicator lamps; ash receiver lights; carpeting; front and rear foam padded seats; carpeted lower door trim panels; rear ash trays; wraparound bumpers and full wheel covers. The Three-Hundred designation, in bright chrome block letters, appeared at the right hand corner of the trunk lid. VEHICLE IDENTIFICATION NUMBERS: The numbering system and code locations were the same as for previous models with the second symbol changed to an 'M' to indicate Chrysler 300. The code 'T' engine was standard equipment. NOTE: The 300-Hurst (or 300-H) was the special high-performance, limited-edition Chrysler 300 model with modifications by Hurst Performance Products Corporation. CHRYSLER 300 SERIES ENGINE V-8. Overhead valves. Cast iron block. Displacement: 440 cubic inches. Bore and stroke: 4.326 x 3.7 5 inches. Compression ratio: 9.7: 1. Brake horsepower: 350 at 4400 R.P.M. Five main bearings. Hydraulic valve lifters. Carburetor: four-barrel. CHRYSLER/HURST 300-H SERIES ENGINEV-8. Overhead valves. Cast iron block. Displacement: 440 cubic inches. Bore and stroke: 4.326 x 3.7 5 inches. Compression ratio: 9.7: 1. Brake horsepower: 37 5 at 4600 R.P.M. Five main bearings. Hydraulic valve lifters. Carburetor: four-barrel.